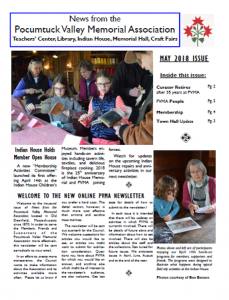 Welcome to the inaugural issue of News from the Pocumtuck Valley Memorial Association including the Teachers’ Center, Library, Indian House, Memorial Hall, and Craft Fairs. Read the May 2018 issue here. Read the June 2018 issue here.